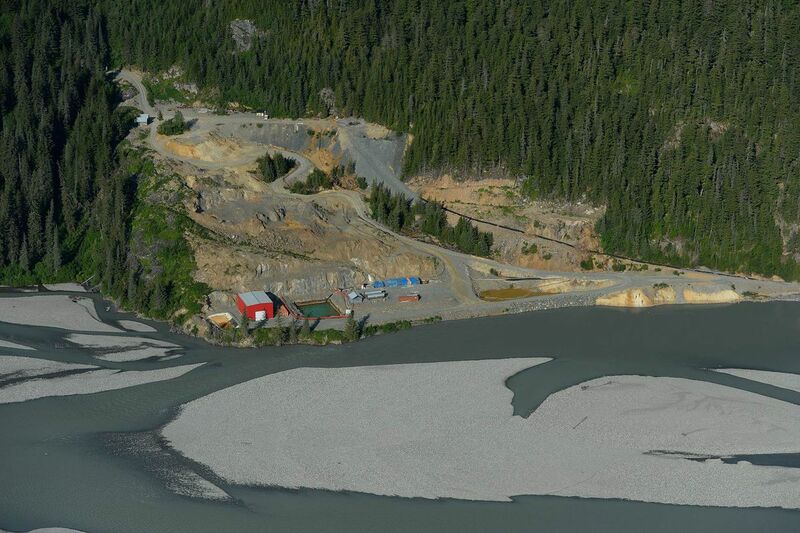 The British Columbia Ministry of Energy, Mines and Petroleum Resources issued a request for proposals Nov. 6 soliciting bids to remediate the Tulsequah Chief mine in the Taku River drainage about 10 miles upstream from the Alaska-British Columbia border. State officials contend the multi-metal mine that operated for just six years has been leaking acid wastewater into the Tulsequah River, which feeds the Taku, since it was closed in 1957. The Taku River empties into the Pacific near Juneau and is one of the largest salmon-bearing rivers in Southeast Alaska. The Alaska congressional delegation and former Gov. Bill Walker’s administration have stepped up their demands for provincial officials to address the situation in recent years — largely at the behest of Southeast commercial fishing and Native groups — after the mine’s latest owners, Toronto-based Chieftain Metals Ltd., began bankruptcy proceedings in 2016. A burst of mining activity in the remote northern region of the province has led to numerous new mines and mine proposals in transboundary watersheds. At the same time, the Energy, Mines and Petroleum Ministry has come under scrutiny for its regulatory requirements of mines after a British Columbia auditor general report concluded the 2014 Mount Polley mine tailings dam breach was the result of inadequate engineering. The Mount Polley copper and gold mine is in the upper reaches of the large Fraser River watershed. Alaska officials have also requested their provincial counterparts assist in conducting baseline environmental studies in the lower reaches of transboundary watersheds to monitor things such as water quality in advance of upstream mine development. Sullivan said in a Nov. 19 statement from his office that he is encouraged the provincial government has finally taken a more active role in cleaning up the troubled and abandoned mine. “The announcement that the government intends to move forward and develop a remediation plan is a step in the right direction. As voices on both sides of the border have been asking for years, it’s time for the B.C. government, the state of Alaska, Alaska Native and First Nations communities to work together to remove this and other looming threats over our rivers, fisheries, communities’ health and wellbeing,” Sullivan said. Walker wrote to British Columbia Premier John Horgan Oct. 31 thanking him for the work the state and province have done on transboundary issues but reiterated an ongoing worry about whether the financial assurances the province requires of mining companies are adequate to protect such rivers. “These concerns arise, in significant part, because statutory decision-makers in British Columbia may accept less than full security based on a company’s financial strength, and the public has less access to the data and analyses used to set the amount of financial assurances in British Columbia,” Walker wrote. He continued to stress that the decades-old problems with the Tulsequah Chief mine do not inspire confidence in the province’s oversight of its mines. Chieftain Metals acquired the underground mine in 2010 with plans to re-open it. The company installed a water treatment plant to resolve the acid drainage problem in 2011 but the plant was shut down in June 2012 after just nine months because it did not perform up to expectations. Chieftain stopped permitting efforts to resume mining in 2015, according to provincial regulators. Proposals to clean up Tulsequah Chief are due by Dec. 13. It’s unclear how much the effort will cost.